While arches are very strong once built, in the middle of building them, they can fall. Before building the arch for the doorway over our heads where it could fall on us, we built a test arch of the same width as the doorway, only on the garage floor. 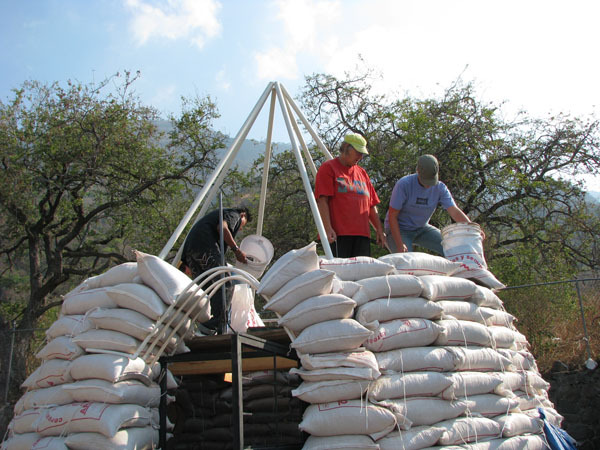 Most earthbag building websites use wooden arch forms. They are very bulky. 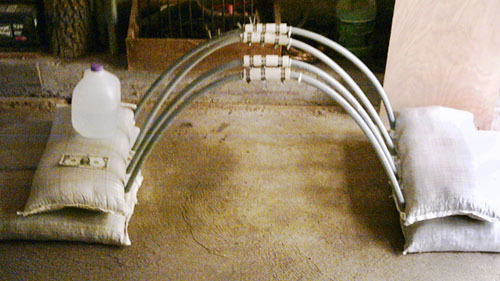 We designed a much simpler arch form using PVC pipe. The gray PVC is rigid conduit. 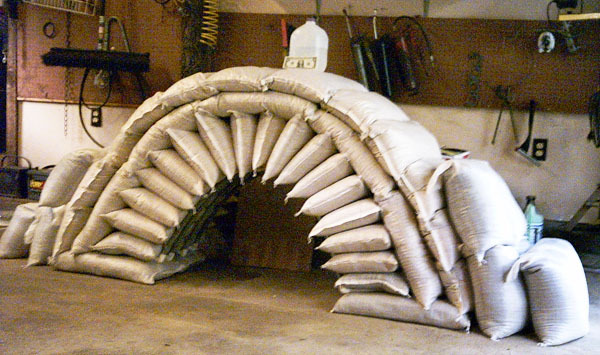 This was too rigid for new rice hulls in 14" x 26" sandbags. Next time, we would use regular PVC pipe for this. We also tried these forms with earth in the bags. The rigid PVC conduit worked great. The 1/2" PVC arch form is cut in half. The arch form parts in the picture are slightly bent because they were used once. The cable ties on them keep the collar centered over the joint. The collar is 1" PVC, cut in half lengthwise, then put back together and secured with hose clamps. The form brace is made out of PVC filled with rebar. We could have used bent rebar, but bending rebar is not that easy to do. 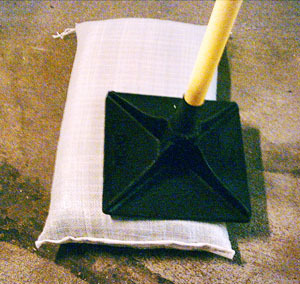 The PVC also slides out from between the bags very easily when done, but rebar would catch on the bags. Form braces are placed in between the courses. 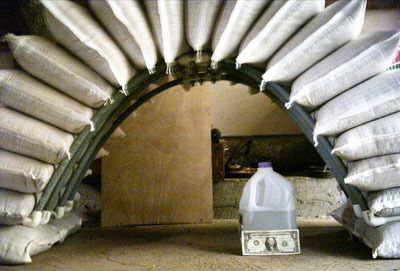 The dollar bill and the gallon water bottle are shown for size comparison. 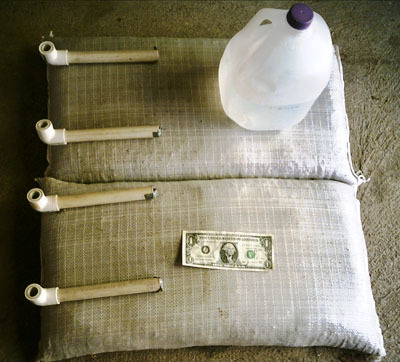 Tamp your bags at a slight angle. Then place them into the arch with the narrow edge against the form. If you build a test arch on the ground first, you'll get a feel for the right angle, and everything else about the process, before you build an arch over your head. Form braces are placed in between the courses. 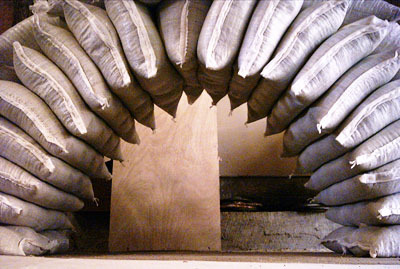 The bags are stacked along the arch forms. For the actual building, barbed wire would have been used between the courses, and the courses would have been tied together, as shown on Kelly Hart's tutorial. This would have made the arch even stronger. However, we were doing a test. 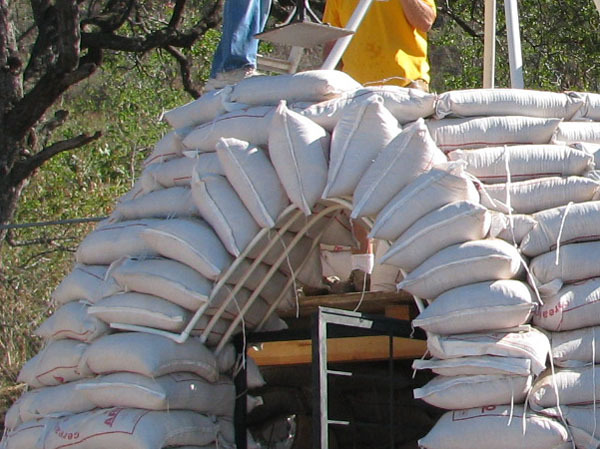 If we could make our test arch support itself without using any barbed wire or ties, we knew that our building would work with them included. The arch is completed before the form is removed. Another row of bags is laid across the arch, to keep it in place. After the arch is covered with another course, the forms can be removed. 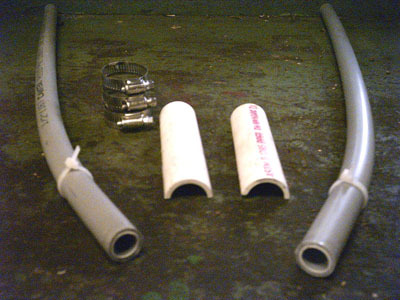 To remove the arch forms, the hose clamps are unscrewed, the collars come apart, and the pvc pipes can be pulled out. If you have not built your arch correctly, this can be most dangerous. With rice hulls, the danger is far less. 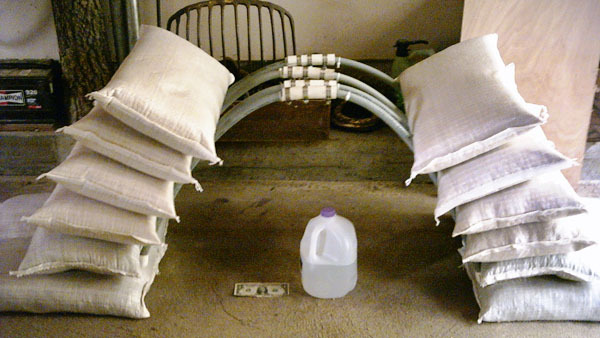 As a somewhat simplified version of this concept, Kelly Hart tried using complete lengths of PVC pipe, rather than coupling two sections together. In order to be able to remove the form later, he made the short sections of pipe that are embedded in the wall at the base of the arch without elbows attached, and instead placed the elbows on the longer arch pieces. 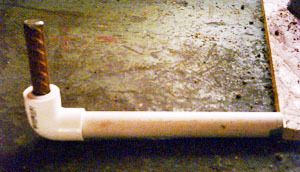 He used a similar method of inserting short pieces of metal to connect the elbow with the piece of pipe in the wall. This made pulling the arch pipe out of the wall easier. This all worked like a charm. Some of the short pipe sections were left embedded at the base of the arch since it was difficult to remove them. Everything else can be reused for another form. 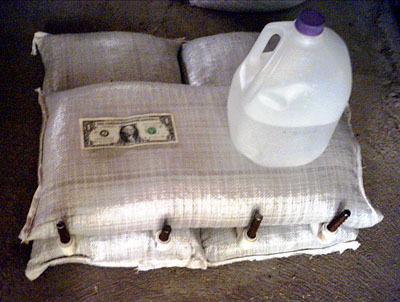 The bags were filled with heavy road base material, and the form held them just fine.